A good signal for talk radio has fairly limited dynamics; the quiet parts aren't too quiet, and the loud parts aren't too loud. This "middle-of-the-road" volume range is the best possible combination for the technical limitations of radio transmission, the varying systems people use to listen to talk radio, the divergent environments in which people listen to talk radio (like driving in the car with kids in the back seat, or outdoors on a job site), and the variety of preferences of different talk radio listeners. If you don't want to take time to learn a bunch of complex stuff and only want to spend between $225 and $400, use hardware. Dynamic processing is absolutely NOT something where "if some is good, more must be great!" Too little compression/limiting/gating/expanding and the unit is not doing its job. Too much and you'll sound like a robot talking over a string and two tin cans inside a vacuum cleaner. If you do your show from a radio station or a network studio, you probably don't have to worry about this. You sit down with your coffee and notes while some brilliant eccentric with the job title of "engineer" twists the right knobs and presses the right buttons to make your feisty rants sound great. However, if you're like me and do your feisty radio rants from home and connect to the network via a Comrex or other magic box, you're probably wearing a lot more hats than just "talk show host." You're probably also the engineer for your show, as well as being the producer, research team, affiliate relations director, ad sales department and webmaster, at the very least. So, I Just Plug in a Compressor and We're Good to Go? When done right (knobs set correctly and all inputs and outputs where they should be), dynamics are the one "effect" you shouldn't hear working at all. The sound will simply be really good. It will be powerful, consistent, commanding, yet natural sounding. If done wrong, your talking will sound squashed, distorted, and/or "you can hear the compression working." Hearing the compression (or gating) working means a really bad "pumping" sound on each word, and/or makes your between-phrase breaths louder instead of quieter. That sounds creepy. Think Darth Vader. Later in this article I'll show you the settings I use with the fantastic DBX 1066. You don't need to know the hows and whys of setting it up this way. If you know your way around a mixer and set things up the same way I did, it should work well for most any talk show, no engineer needed. The dynamic range of human speech, from a whisper to yelling, is far too wide for talk radio. Without some compression, limiting, and sometimes a little expanding and gating, the average feisty radio show would have sections that are too loud and distorted, and parts that are so quiet they'd be lost in the background noise of someone listening in their car. Not all hosts have good mic technique. Mic technique is the act of intuitively backing off the mic a bit when you speak louder, and getting closer to the mic when you speak more quietly. Mic technique is sort of natural compression, without hardware or software. Even with hardware dynamics units, you'll sound better if you have at least some mic technique. I used to do my show through the mono Presonus studio channel Compressor Tube Preamp (which I reviewed on Creamy Radio Audio HERE and wrote more about in TALKERS HERE). But it didn't quite do all I needed, and it added a tiny bit of audible noise. I recently gave that unit to a friend and got the DBX 1066. It's an amazing unit. It's totally quiet, has a lot of useful variables, and has two channels. List price new is $537, but I got a good used one for $225 on Amazon. You can usually find them new for $375-$425. The DBX 1066 Dual Compressor Limiter Gate came out in the mid 90s. But it's a time-tested workhorse that's still in production, and in demand, today. The one I have has a faded production sticker on the side that says "March 96″ and it still works fine. It's also a great unit for recording ads, liners or voiceover. If you have a co-host in the same room, rather than over Skype, the settings should work fine. Just hook your co-host's mic into the mixer channel where I show connecting to the Skype computer. You'll get better sound in this setup with a co-host over Skype if both you and the co-host go into your Skype settings (Tools/Options/Audio Settings) and turn off the tick mark for "Automatically Adjust Speaker Settings" and "Automatically Adjust Microphone Settings." Then turn the software volume slider for both all the way up, and hit Save. While you're in there make sure also to set the proper input and output device, usually the sound card on your end, and the USB mic and headphones on the co-host's end. If you have a three- or four-host show with everyone in the same room (or if two or three are in the same room and one is remote over Skype), there is a four-channel version of the DBX 1066. It's the DBX 1046 Quad Compressor Limiter. You can usually find it new for around $500. 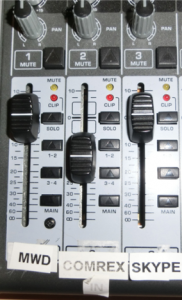 I use channel 1 of the DBX 1066 for my mic, and use channel 2 for the co-hosts. The sound is beefy, but clear. It's without noise and never distorted. This thing rocks the airwaves. The settings for channel 2 are the same. Note that the Stereo Couple is NOT engaged, i.e. the button is Out and not lit up. With that button engaged, the settings on Channel 1 control Channel 2, not matter what settings you have on Channel 2. You don't want to do that for a two-host show, in case you need to tweak one channel or the other to taste. One of the main things that's easy to tweak on the DBX without a lot of advanced understanding is the Output Gain knob. You may need to change that depending on how loud you are in general, and how close to your mic you work. I tend to be pretty close, about three inches. 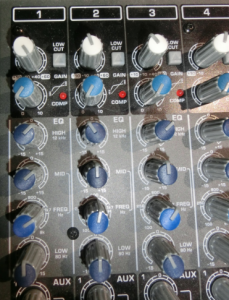 If you work further away from the mic (many hosts do), you may need to turn the Output Gain up. A quick way to tweak it is to talk into the mic at your normal average show volume, and push the I/O Meter button in and out every few seconds. You've properly tweaked the Output Gain knob when the lights above the I/O Meter button are reaching the same dBu level when the button is in as when it's out. The I/O Meter button controls whether those lights are metering your input level or your output level, and the levels should be very close to the same when everything is set correctly. The Red side marked "Ring" goes into the 1/4″ jack on the back of the DBX marked "Pin1/Sleeve. Pin 2/Tip. Pin 3/Ring." The Black side marked "Tip" goes into the 1/4″ jack on the back marked "Inputs." The other end of the cable, the single 3-ring 1/4″ male jack, goes into your mixer's Insert jack on the mixer channel you want to use. I'm using a dynamic mic. The settings would be much different for a condenser mic, but I don't recommend condenser mics for talk radio. Condensers are great for music, but too sensitive for live talk radio. They pick up a lot of room noise. I'm not using an external preamp; I'm using the preamp built in to the mixer. My mic is connected via 6-foot XLR. The shortest cable you can use, the better. The XLR cable is plugged directly into the top of Channel 1 on the mixer. 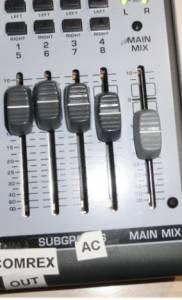 Channel 2 on the mixer is the Comrex. Channel 3 on the mixer is the Skype computer with the remote co-hosts. The Skype computer has a very good M-Audio Delta PCI slotted sound card with an external breakout box. They no longer make the model of sound card I'm using, but you want one like that. You don't want to plug headphone inputs and outputs from a computer into a mixer. NOTE: These are great settings for talking, but not great settings for music. If you're adding music to your show from your end, it should be going through a different channel without going through the DBX 1066. Most professionally produced music already has excellent dynamics, so you won't need to add any on your end. If you listen to any Freedom Feens show recorded after October 28, 2014, you'll hear the creamy radio audio sound of the DBX 1066 Dual Compressor Limiter Gate, on both myself and the remote co-hosts coming in over Skype. The DBX 1066 Dual Compressor Limiter Gate is still widely purchased and utilized in many radio stations, music recording studios, and live sound applications. It's a great low-cost solution to a basic issue that must be addressed for setting up a home talk show studio connecting remotely with a network. Your listeners will really appreciate it, and so will the engineers and board-ops at your network.